What if we told you that there was one single, easy way that you could seek to truly better your life? That, if you practiced this one simple thing every day, you would increase your satisfaction, up your confidence levels, and help allow you and all the people with whom you interacted to feel happier and more positive? Well, there is, in fact, a way to succeed in doing exactly this. No, it is not some product available at the Apple store; it is not a new workout plan or a relaxing getaway. You already have the power to do exactly this, right within your own self. In order to feel better, help others around you also feel better, and increase your confidence and enjoyment of life. All you have to do is smile. The science behind smiling is truly awesome. It takes just twelve muscles to smile, and the results are astronomical and intensely beneficial. Psychologists have discovered that smiling succeeds in boosting your mood, and improving your physical health, too­ smiling relaxes the body and contributes to a stronger immune system. On top of that, smiling has been proven to reduce stress, increase your enjoyment of a difficult or irritating task, and even boost your workplace performance: people who smile are perceived as more confident, successful, sociable, and attractive, and are probably far more likely to receive a promotion than people who refrain from smiling.Clearly, the effects of smiling are beyond beneficial­ but what if you couldn’t smile? What if there was something preventing you from flashing those pearly whites each and every day? 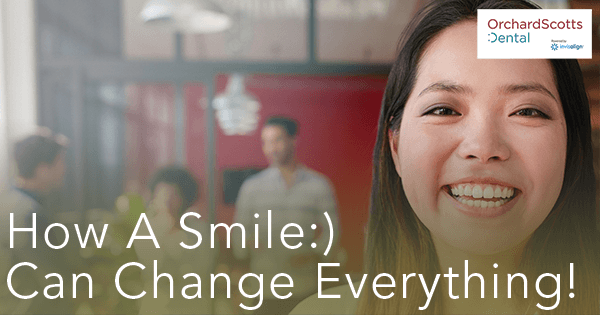 Clearly, the effects of smiling are beyond beneficial­ but what if you couldn’t smile? What if there was something preventing you from flashing those pearly whites each and every day? What Is Stopping That Smile? Dental malocclusions are the main culprit behind a person’s refusal to smile. Misaligned teeth, such as overbites, crowding, underbites, and more are malocclusions that affect the alignment of a person’s teeth and/or jaw, and can make individuals feel a need to hide their teeth. Gummy smiles occur when a patient’s gum tissue appears larger than the teeth, and can cause patients to feel self-conscious about their smile; missing teeth can be a great source of embarrassment, and can cause patients to never want to show their teeth at all. Not only do these dental problems cause a patient pain, but they seriously affect the patient’s confidence and ability to experience the great benefits and joy that smiling can bring. Our team of dentists in Singapore from Orchard Scotts Dental can help you smile again. Whether you are suffering from missing teeth, gapped teeth, or any other dental malocclusion, we at Orchard Scotts are committed to giving your smile a makeover and helping you to feel your best. We are an Align Technology certified Invisalign clinic in Singapore that can provide you with Invisalign aligners in order to remedy overbites, underbites, crowding, gaps, and so much more. Orchard Scotts can remedy those gummy teeth with painless laser gum reshaping, and fix other teeth insecurities with porcelain veneers or top of the line teeth whitening services. Orchard Scotts is even able to offer you special personalized dental implants in order to help you look and feel your best. When it comes to smiling, we know that straight teeth can make all the difference. Orchard Scotts is here to put a smile on your face that lasts the rest of your days!